When a long weekend is coming, I usually try to find a book to get me through it. Over the last few years, I have read just about everything from some of my favorite writers like Tom Clancy, Ken Follett, J.R.R. Tolkien, even J.K. Rowling’s “Harry Potter” series. They’ve all helped me endure long stints of being locked inside on an otherwise beautiful day. But my first ever “Stuck Inside Literary Award” is going to the late Patrick O’Brian, author of the 22-volume “Aubrey-Maturin” series of historical novels. Okay, stop yawning! These are very special books. Patrick O’Brian was an Irish writer who used real Royal Navy ships’ logs from the age of Napoleon to weave his stories, and he was masterful at it. The only truly fictional characters are often the two protagonists, Captain Jack Aubrey and ship’s physician Stephen Maturin, placed on deck by the author. 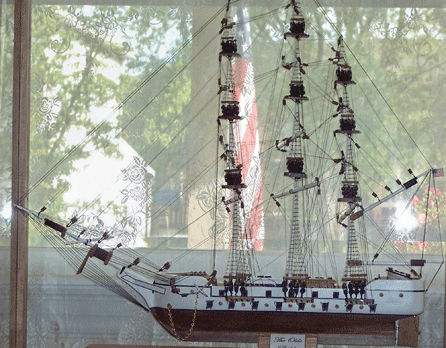 The series follows the adventures of Captain Jack Aubrey from his first stint as Master and Commander – the title of the first book – in the British Royal Navy. The book became an Oscar-winning film starring Russell Crowe as the daunting Captain Aubrey. Several years ago, one of my nieces sent me the first four books in the series, and the prison library had the next five, so I have read less than half the series. I just reserved number nine, Treason’s Harbour (W.W. Norton, 1983), to read over Labor Day weekend. Even after all my squawking about being locked up for long weekends, I’m looking forward to reading it. 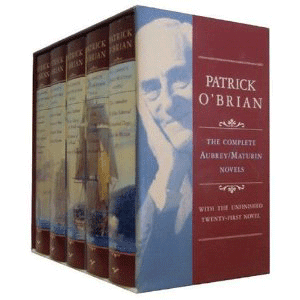 Patrick O’Brian’s publisher has compiled all 22 volumes – and, posthumously, a partially written 23rd – into a four-volume set that I hope one day to read from the beginning. A part of what made this series so very special is that I first wrote of these books in “Come Sail Away! Pornchai Moontri and the Art of Model Shipbuilding.” While I’ve been reading these nautical adventures, Pornchai has been carving some of these very ships from the Age of Sail that I wrote about in that post. 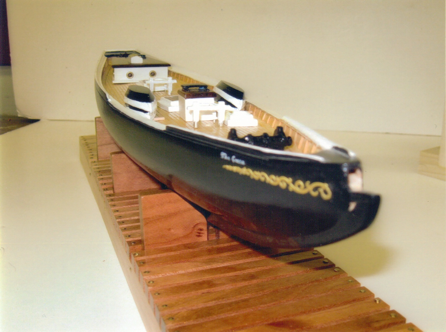 As he designs his Royal Navy warships and other vessels, we’ve had long discussions about the decks, masts, rigging, and sails that have been part of my nautical education from Patrick O’Brian’s books. As I wrote in “Come, Sail Away!” so many of the terms we use today in casual conversation had their origins on the decks of British Royal Navy vessels from the Napoleonic era. The very walls around us in this cell are decorated with photos of Pornchai’s ships, and I can place myself upon some of their decks as I read of Captain Jack Aubrey. A few TSW readers – notably Sharon Morris and Lavern West – have traveled to New Hampshire to obtain one of Pornchai’s vessels. Lavern has a magnificent tall ship displayed in her living room window in Cincinnati with some beautiful handcrafted stained glass in the window just above it. She sent a photo which Pornchai proudly added to the collection on his cell wall. One day, a guard came into this cell and was looking intently at the photos of Pornchai’s beautiful ships. When he saw the one in Lavern’s window, he said “Wow! That’s just incredible.” Pornchai smiled and sat up straight waiting for the usual comments about his carving skill. Then the guard said, “That’s some of the nicest stained glass I’ve seen!” I just about hurt my ribs laughing. Pornchai told me that on his next ship, he’s adding a plank for me to walk. It’s not a case of “great minds think alike,” but Editor John Norton wrote of the Patrick O’Brian series in a recent editorial in Our Sunday Visitor (”Summer reading that makes for poor – or better – Dads,” OSV July 24, 2011). John Norton cited many of the same details that have drawn me to these novels, especially the Catholic sub plots. Captain Jack Aubrey, like every officer in the Royal Navy at that time, was a loyal member of the Church of England with a disdain for “papists” and “popery.” However, his best friend, ship’s physician Stephen Maturin, is a devout Irish/Catalan Catholic and a spy for British intelligence. Stephen Maturin introduces into the stories an intrigue and commitment to reason that counterbalances Jack Aubrey’s “full speed ahead” style.